H5 today announced the launch of H5 Matter Intelligence, a powerful resource management dashboard application for Relativity, kCura’s e-discovery software. 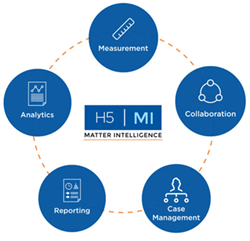 H5 Matter Intelligence provides real-time access to the billing and project analytics users need to make well-informed decisions by and across matters. Whether it’s litigation, information governance, a government request, or an internal investigation, Relativity provides organizations with a complete set of flexible tools to tackle their unique challenges through every phase of a project. As a platform, Relativity allows developer partners like H5 to design, build, and integrate applications that extend its functionality. With a robust dashboard producing real-time, aggregated information and offering one-click, drill-down capability for category details, users are empowered to control costs and manage resources more effectively across matters. Customizable, automated notifications and reporting provide timely intelligence for ongoing project oversight so that users can take immediate action to keep their matters on track. H5 Matter Intelligence is now part of the Relativity Ecosystem, which includes applications and integrations built by Relativity developer partners. H5 is a leading provider of eDiscovery and technology-assisted review services. With expertise in all aspects of the eDiscovery process, H5 excels at managing and delivering processing, hosting and related services. In addition, H5 is dedicated to finding information that clients need to win cases, meet regulatory requirements and address risks before they become liabilities. By combining advanced technologies with expertise in search and information analysis, H5 delivers customized solutions to help corporations and law firms meet their litigation discovery, legal compliance and information management objectives. Numerous independent studies have demonstrated that H5's approach delivers greater cost savings and more accurate results than other alternatives. Please contact info@h5.com for more information or visit our website at http://www.h5.com. Explore how H5MI and H5's relationship-focused services can change your eDiscovery experience. Explore H5's full range of eDiscovery, Technology-assisted Review, and Key Document Identification services. You need it. We find it. Explore our Managed Services options and learn how H5's IaaS can help you store and manage your eDiscovery data.